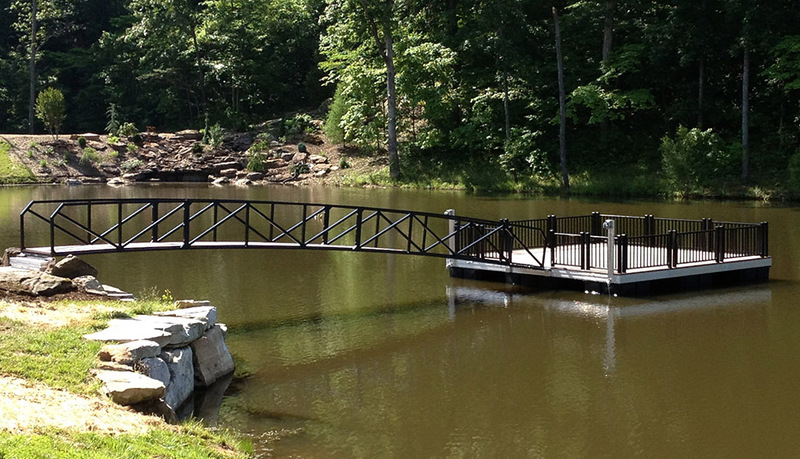 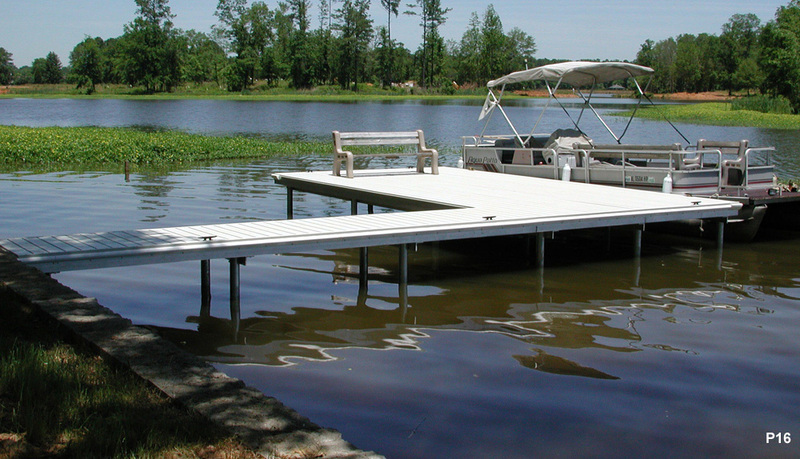 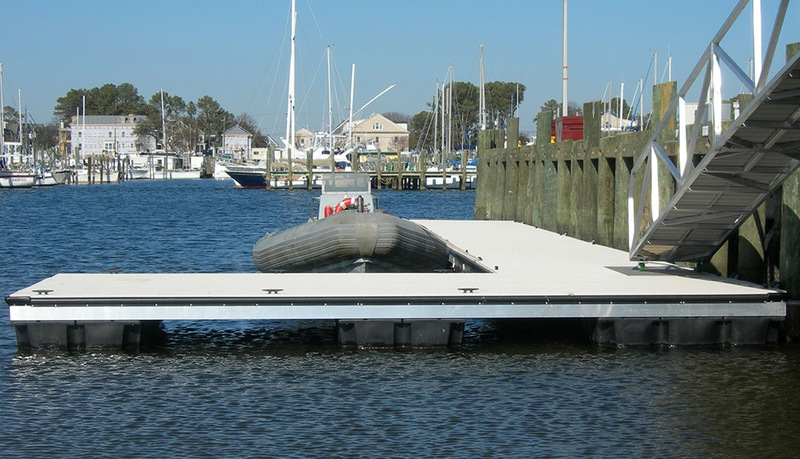 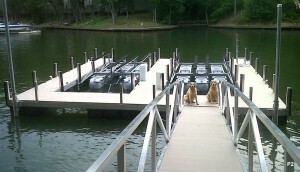 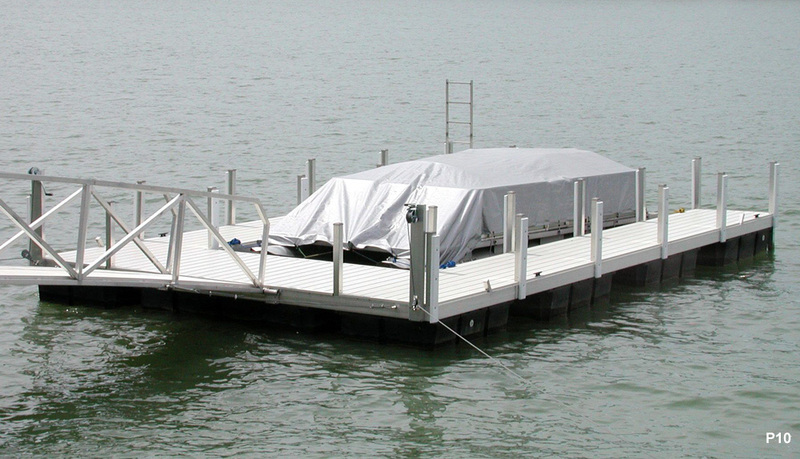 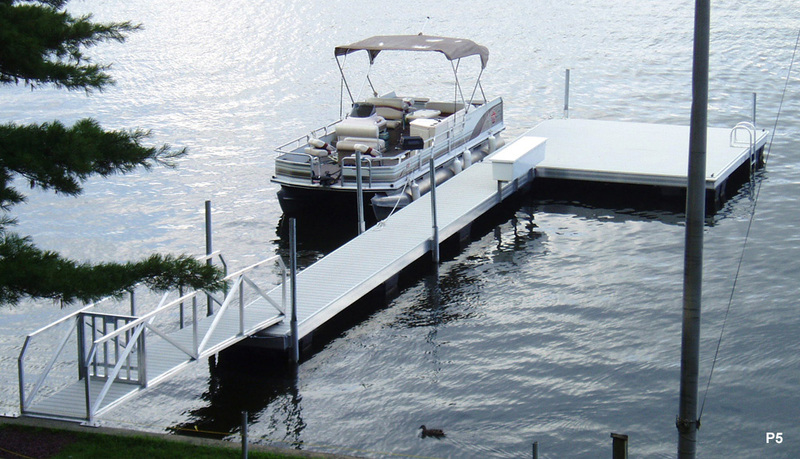 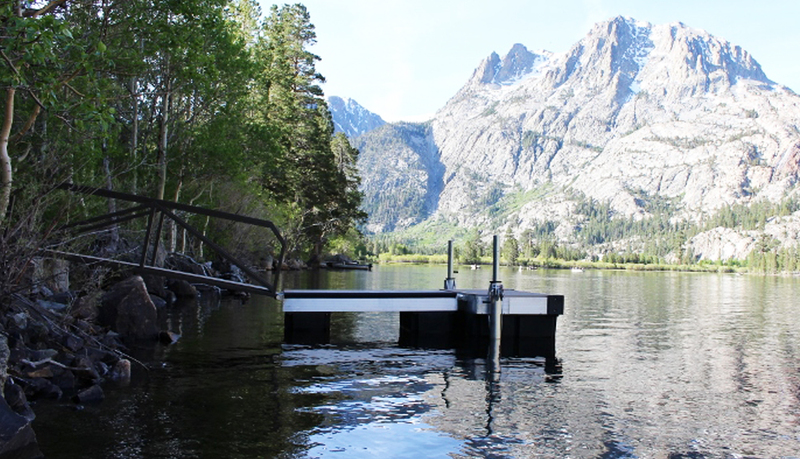 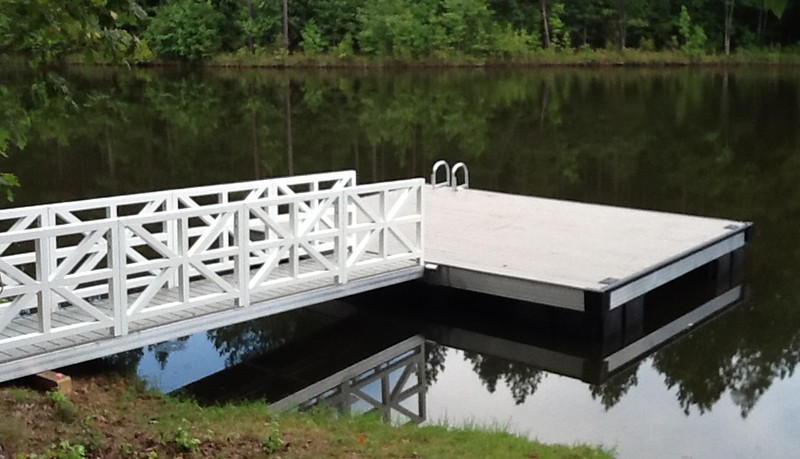 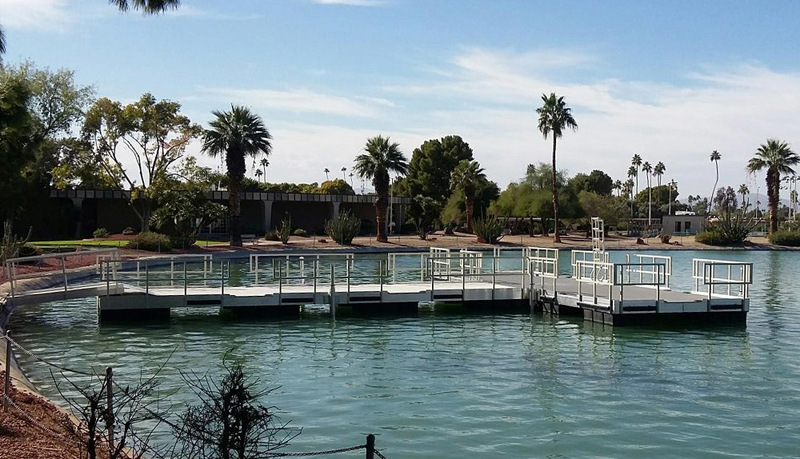 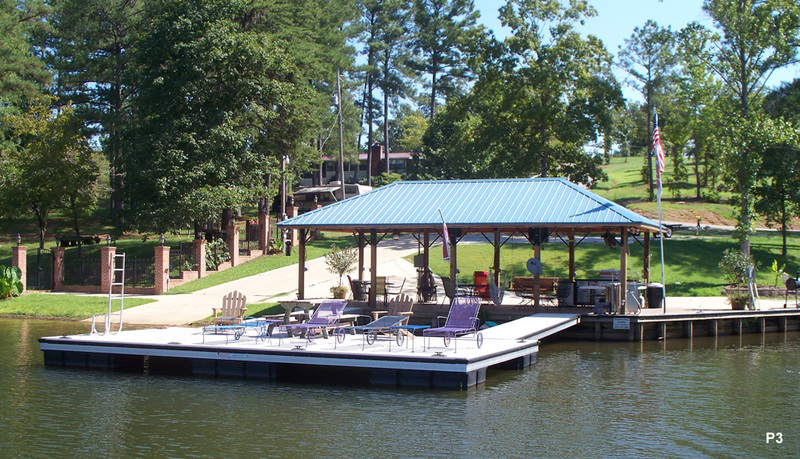 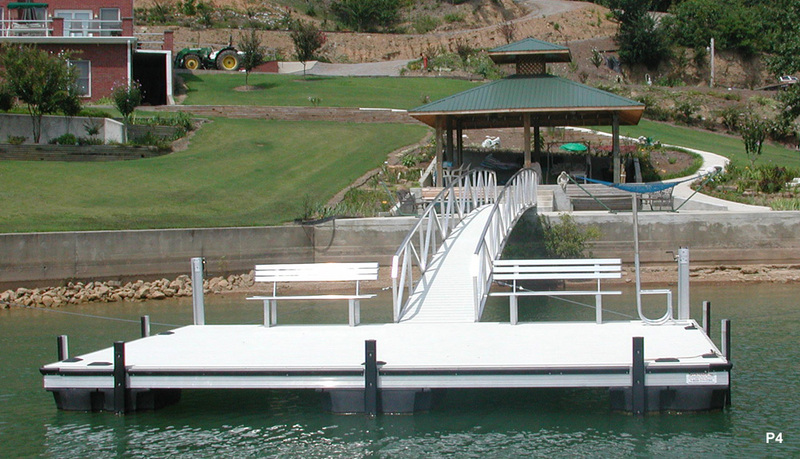 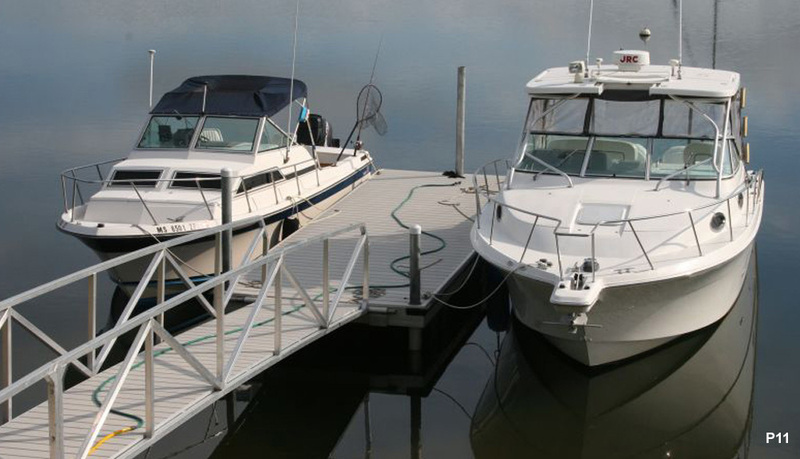 Welcome to the gallery of dock piers and platforms we’ve created for customers nationwide. 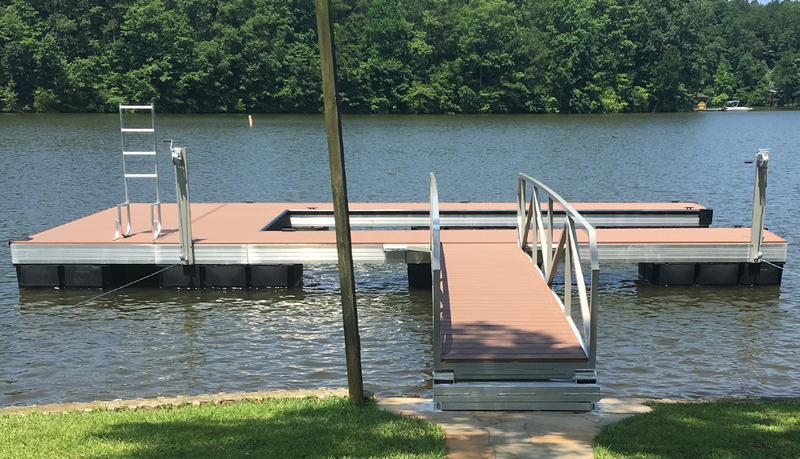 Each photo is numbered in the lower right corner – when you find a design, color, accessory, or whole dock you love, make note of the number and pass it along to your dealer. 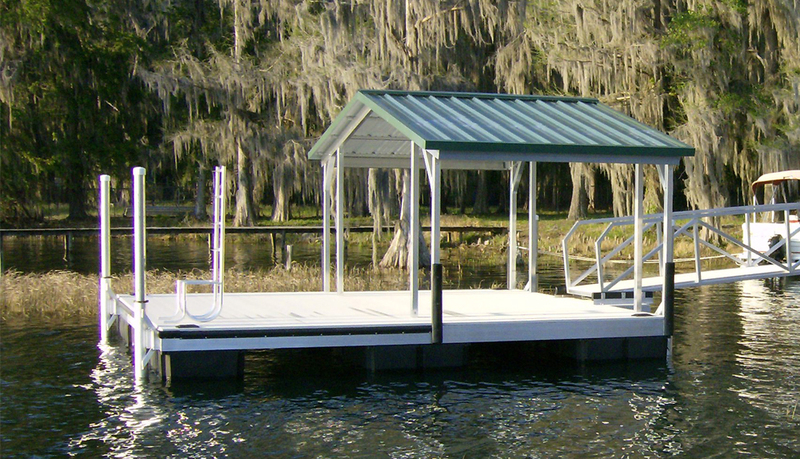 Enjoy our boat dock pier and platform gallery! 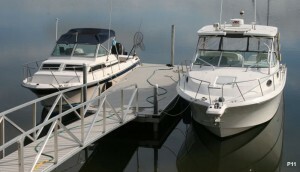 P25. 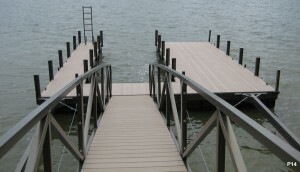 Burnished slate ramp railings and buckskin decking. 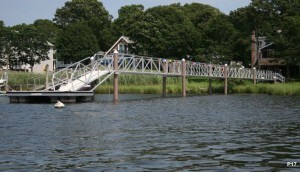 P26. 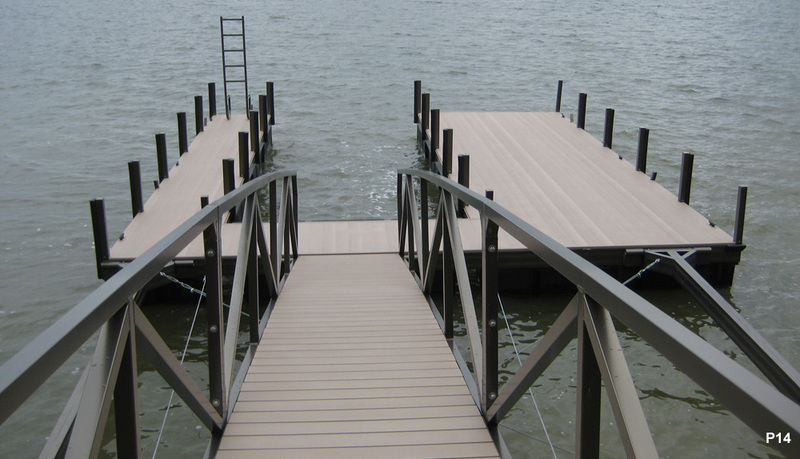 Buckskin decking with burnished slate railings, posts, and roof. 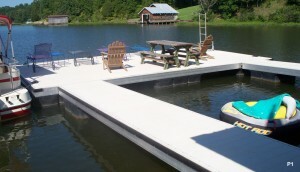 Also shown with two dock benches. 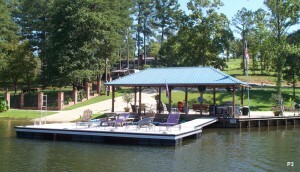 P27. Silverstone decking matched with hunter green roof panels. 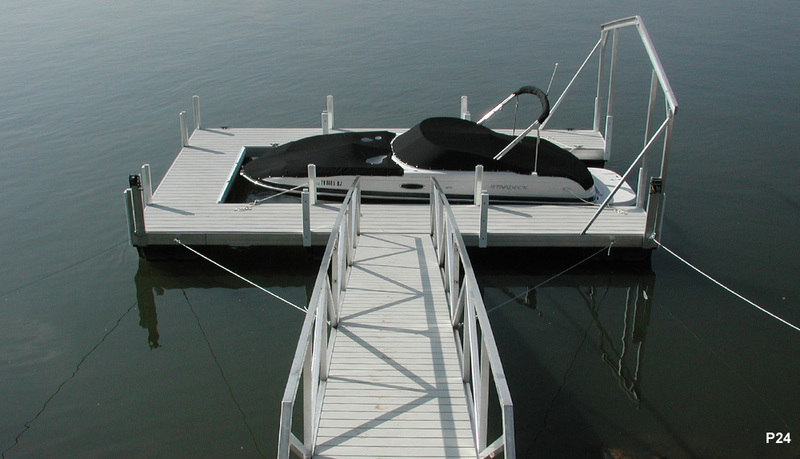 Shown with optional 5-step swim ladder and spud pole anchoring system. P28. 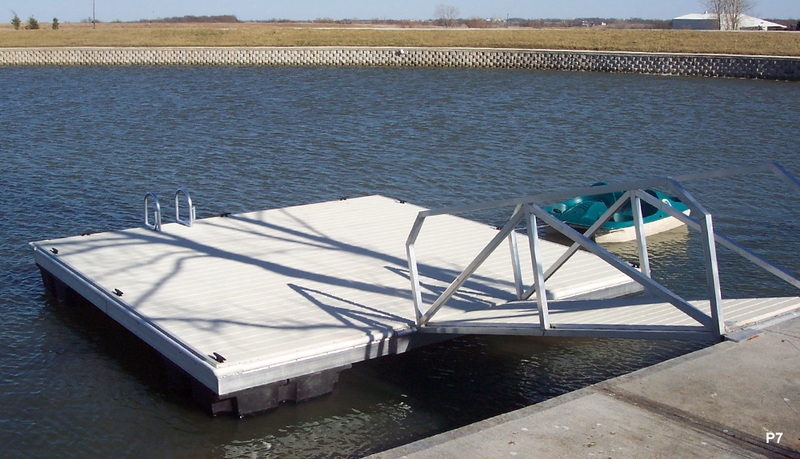 Simple yet effective docking platform with buckskin decking. Shown with our optional spud pole anchoring system. 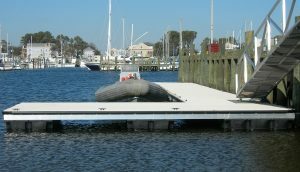 P29. 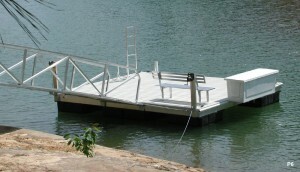 Single slip swim platform. Shown with Buckskin decking and optional retractable swim ladder. 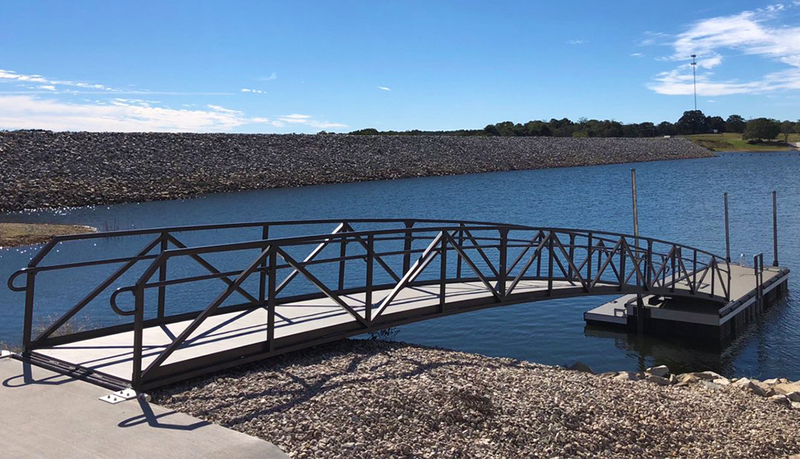 P30. 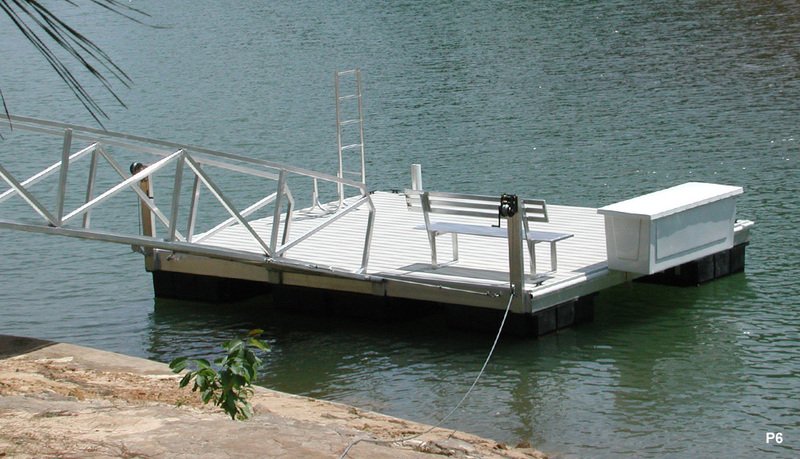 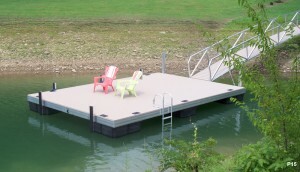 Single slip pier with buckskin decking. Shown with custom spud pole anchoring system. P31. 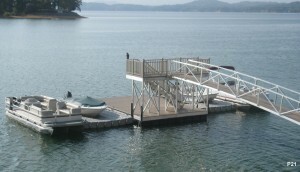 Governor’s Club pier shown with buckskin decking and black railing. 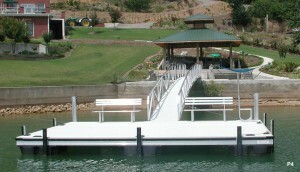 P32. 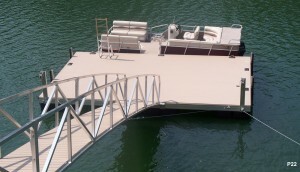 Platform shown with buckskin decking and burnished slate powder coated railing. P33. 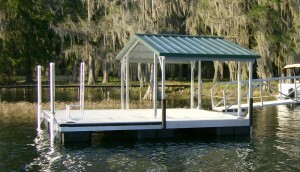 Stationary platform with gable roof shade. 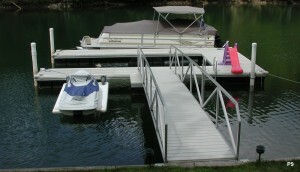 Shown with burnished slate powder coated railing and silverstone decking. P34. 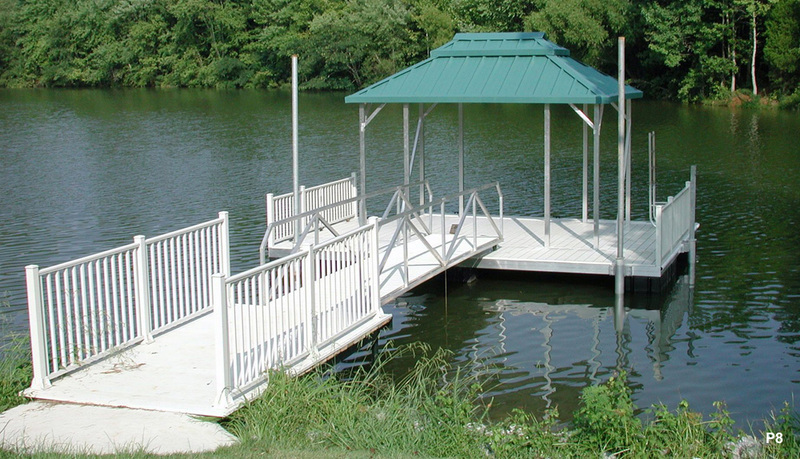 Gable covered swim platform. 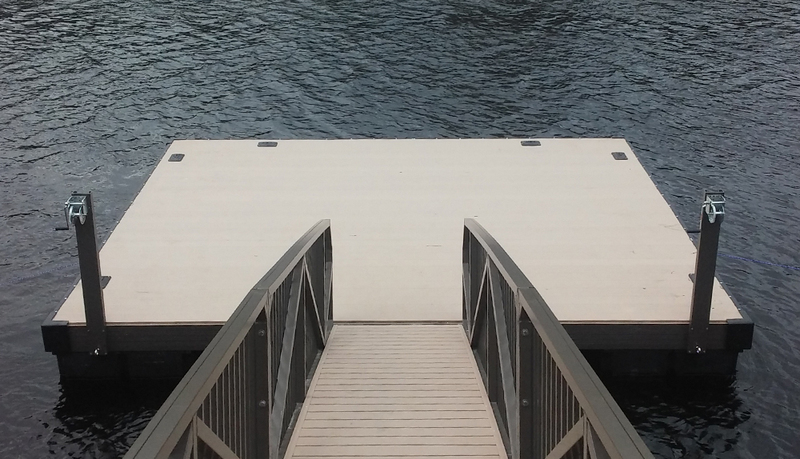 Shown with burnished slate roof panels and silverstone decking. Also shown with optional picketed gangway & SUP rack. P35. Boarding pier on Duck River, Alabama. 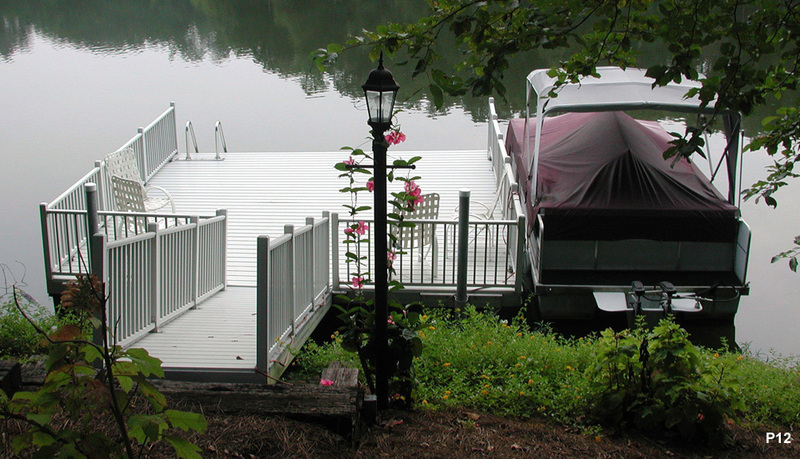 Burnished slate railing with buckskin LockDry aluminum decking. 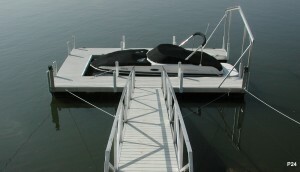 P36. 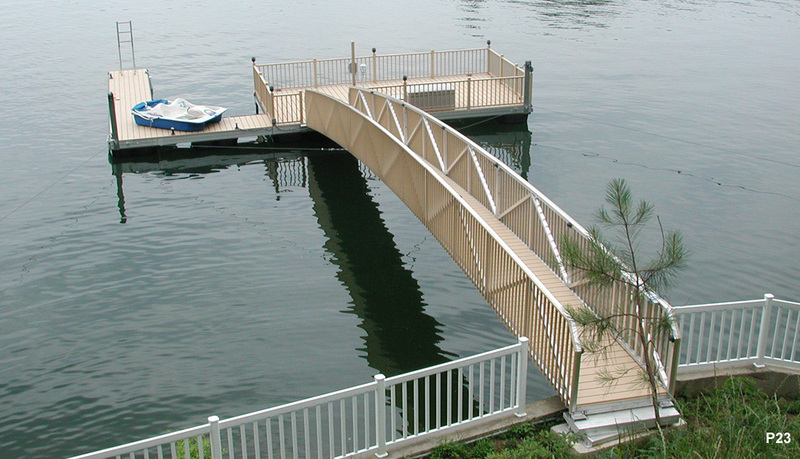 Platform with 6 ft. walkway and custom handrails. Shown with granite gray aluminum decking and optional spud pole anchoring system. 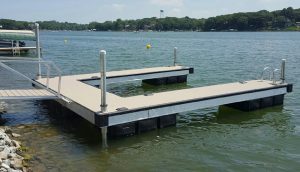 P37. 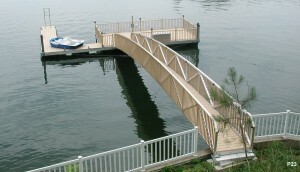 Swim pier with custom “Union Jack” style gangway railing. 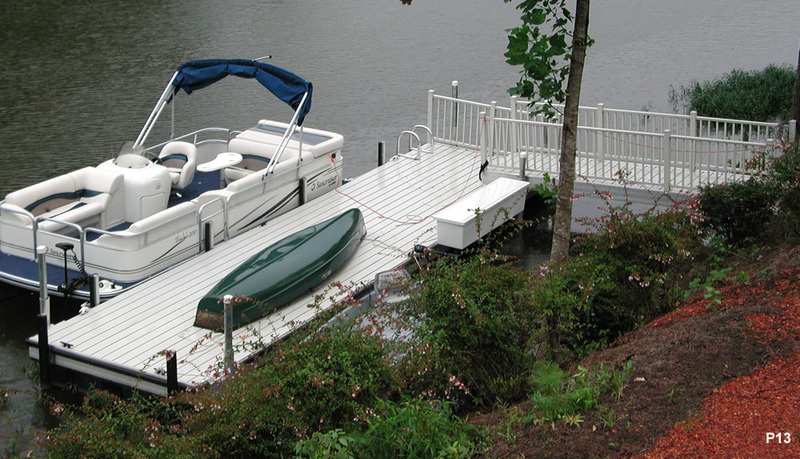 Powder coated white with silverstone LockDry aluminum decking. 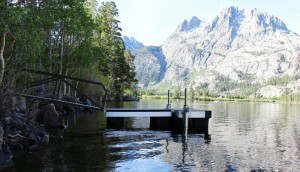 P39. 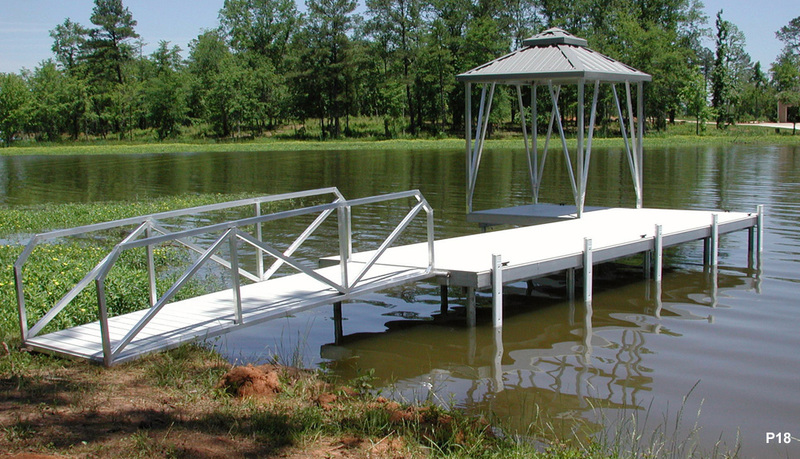 Aluminum platform with handrails. 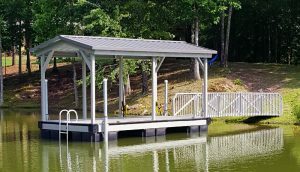 Shown with gallery blue roofing and silverstone aluminum decking. P40. Split handrail aluminum platform with black railing and silverstone decking. 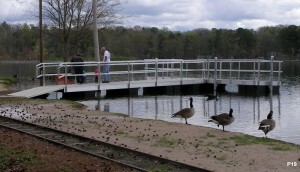 P41. 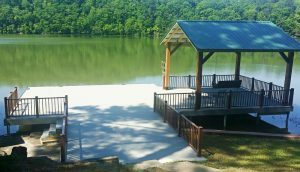 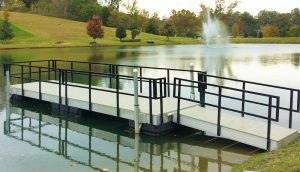 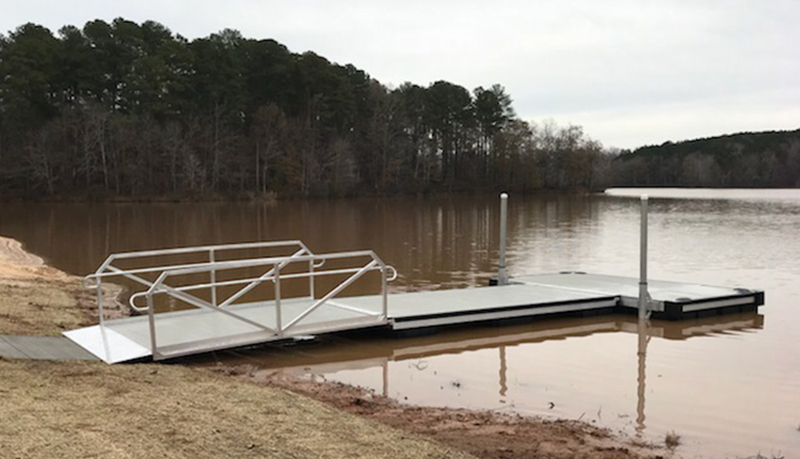 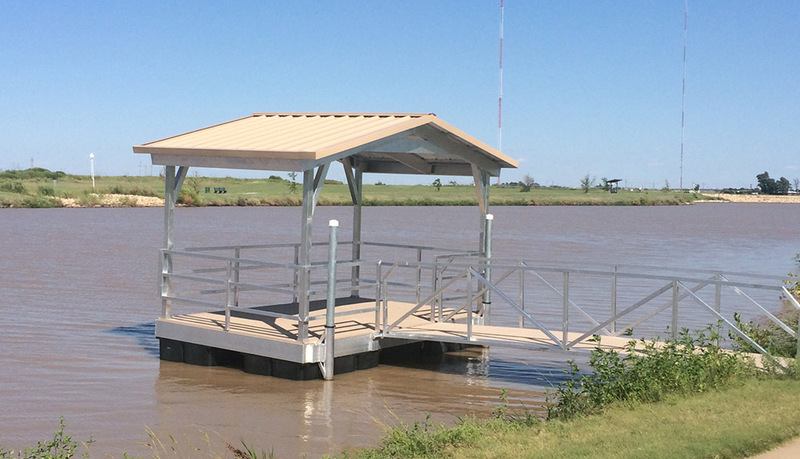 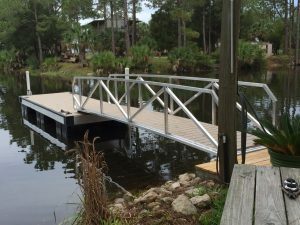 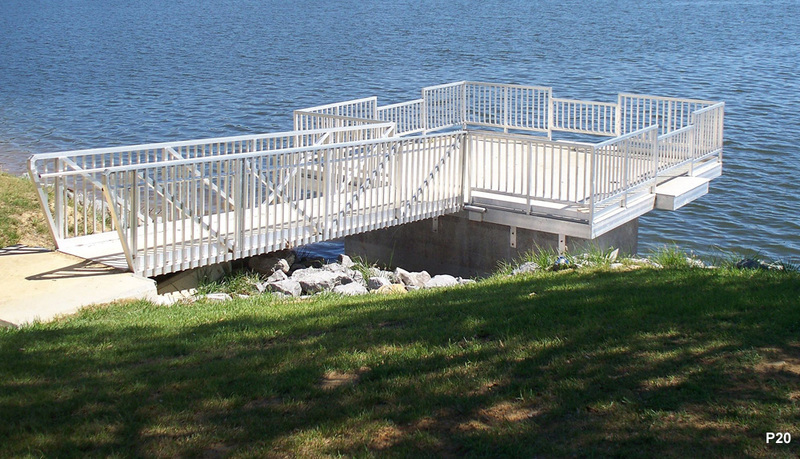 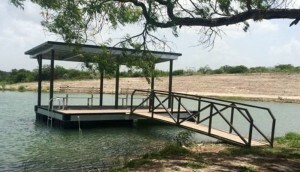 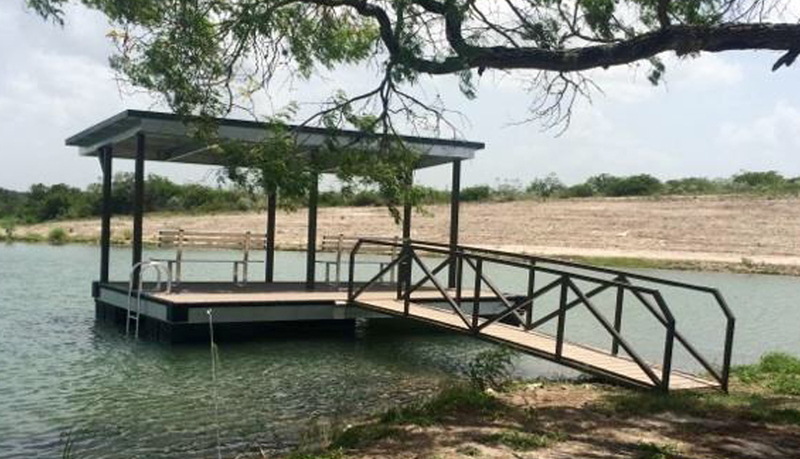 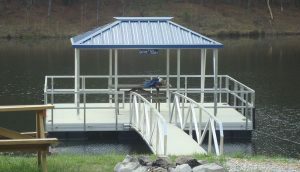 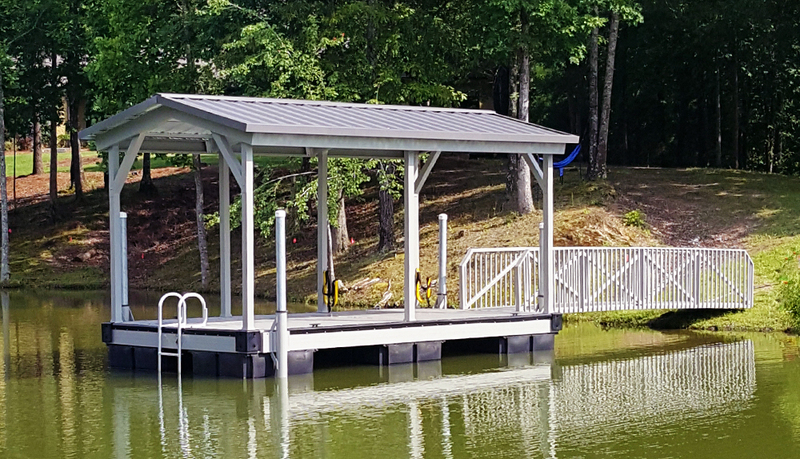 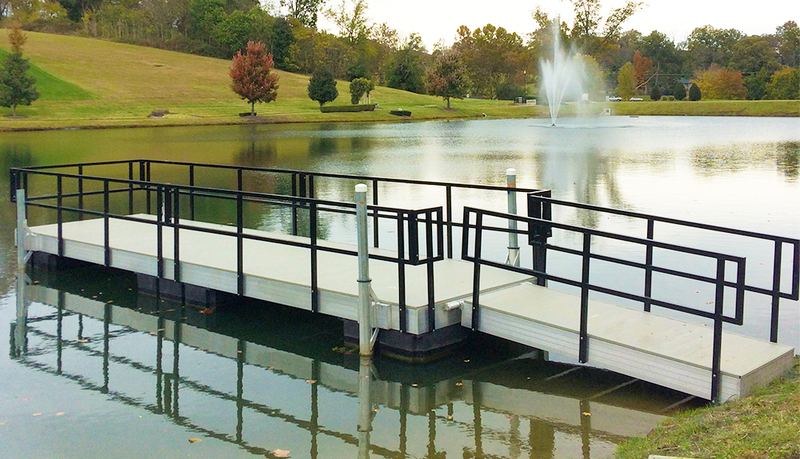 ADA-compliant private aluminum fishing pier. Silverstone railing and Silverstone aluminum decking. 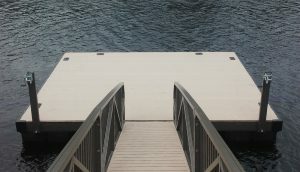 P42. 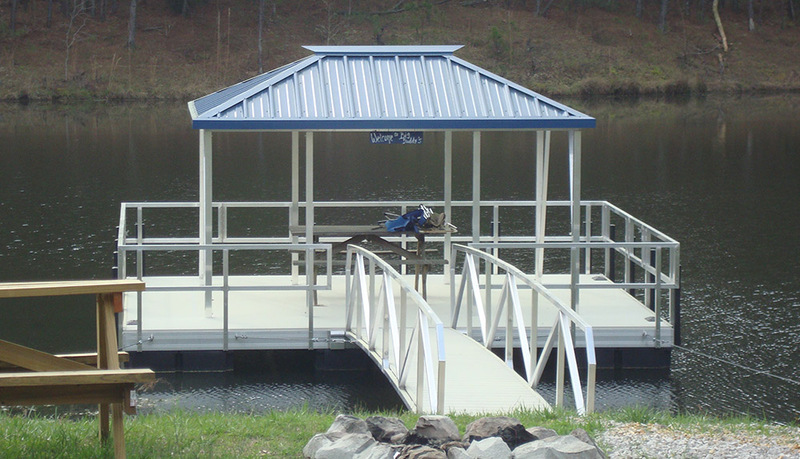 Enclosed gable roof aluminum platform with buckskin roof panels and aluminum decking. 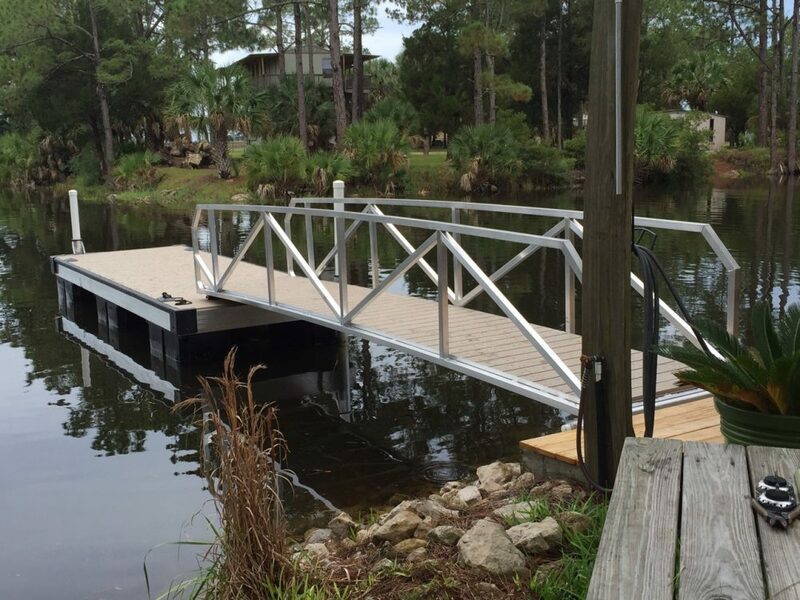 Customized to you and your waterfront.